Feed more air into the 2.3L EcoBoost engine of your 2016+ Ford Focus RS with Mishimoto’s newly released cold-side intercooler pipe. This design increases the internal volume by 31% over its stock counterpart and has a 46% pressure drop improvement. The design is flexible enough to make install a breeze, yet durable enough to withstand just as much increased boost pressure abuse as an aluminium counterpart. It is made of five ply silicone and reinforced with steel wire to prevent any misshaping under vacuum. It is also one solid piece through and through, eliminating the need for couplers. Nobody likes failing couplers that cause boost leaks, anyway. This hose is available in black, comes with stainless steel T-bolt clamps, and installs in under 30 minutes. Of course, it is also backed by our coveted Mishimoto Lifetime Warranty. The Pumaspeed Workshop team are ready to fit the Mishimoto Focus RS Mk3 Cold-Side Intercooler Pipe Kit in our Head Office located here. Therefore making parts and labour a total cost £320.00 (inc. VAT). 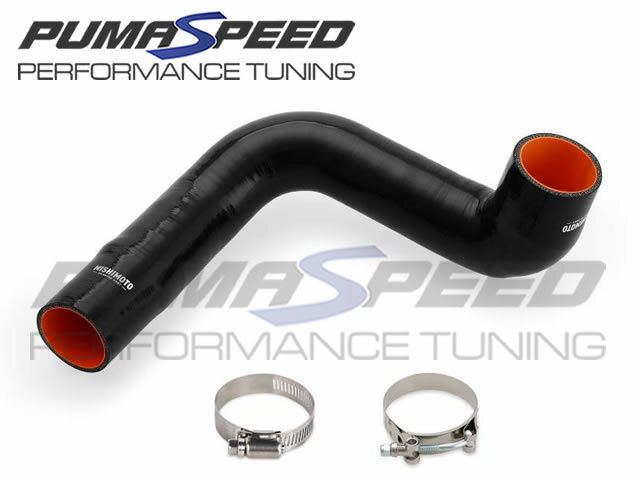 Pumaspeed have a specialist distribution team that can dispatch the Mishimoto Focus RS Mk3 Cold-Side Intercooler Pipe Kit to any destination worldwide.